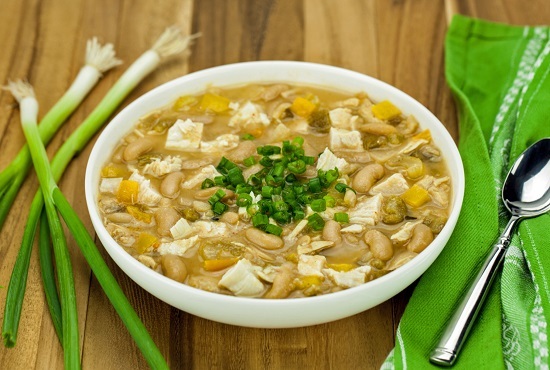 Chicken White Bean Chili Recipe. Love Chicken Enchiladas and Verde Sauce? Then you’ll love this quick & easy chili recipe made in crock pot or on stove top. DIRECTIONS—cube chicken, gently heat oil in in a large Dutch Oven, add chicken and sauté for a few minutes, then add onion, bell pepper, celery, and garlic. Sauté until partially cooked. Add broth, flour, bullion, seeds of chili pepper, and spices. Bring to a boil, reduce heat, and simmer about 30 minutes or until chili is thickened and vegetables are tender. Drain and rinse beans, add last 5 to 10 minutes of cooking just long enough to heat through, before serving. Optional, garnish with cheese, add a dollop of yogurt or sour cream, top with chopped green onion, avocado, or cilantro and diced chili pepper. Note: omit sour cream and cheese for 7 Day Slim Down Plan. NOTE—omit chili pepper seeds for milder chili and/or reduce amount of chili powder. Use more chili pepper seeds and/or chili pepper power for spicier chili. Or add chopped jalapenos peppers to chili. DIRECTIONS: preheat oven to highest temperature. Cut tortillas into strips. Place on a wire rack over parchment lined baking sheet. Spray strips lightly with oil. Salt strips, if using salt. Turn strips over. Spray with oil on other side. Add salt, if using. Bake until crunchy. About 5 minutes. Serve with soup. 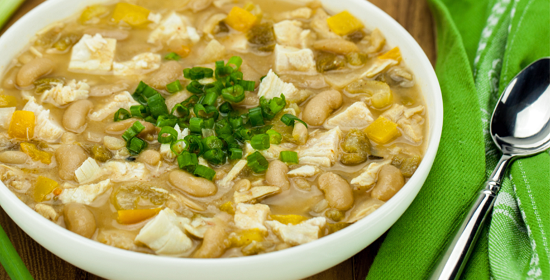 Metatags: Chicken White Bean Chili Recipe. Love Chicken Enchiladas and Verde Sauce? Then you’ll love this quick & easy chili recipe made in crock pot or on stove top. Should have ability to print recipes. Thanks, will work on it!